Transcontinental mail service was heavily subsidized by the Federal government. In 1859, the Butterfield Overland Mail operated a stagecoach route from St. Louis, MO, to San Francisco, CA, via El Paso, TX. The company had a Federal contract worth $600 thousand but generated receipts of only $27.2 thousand. 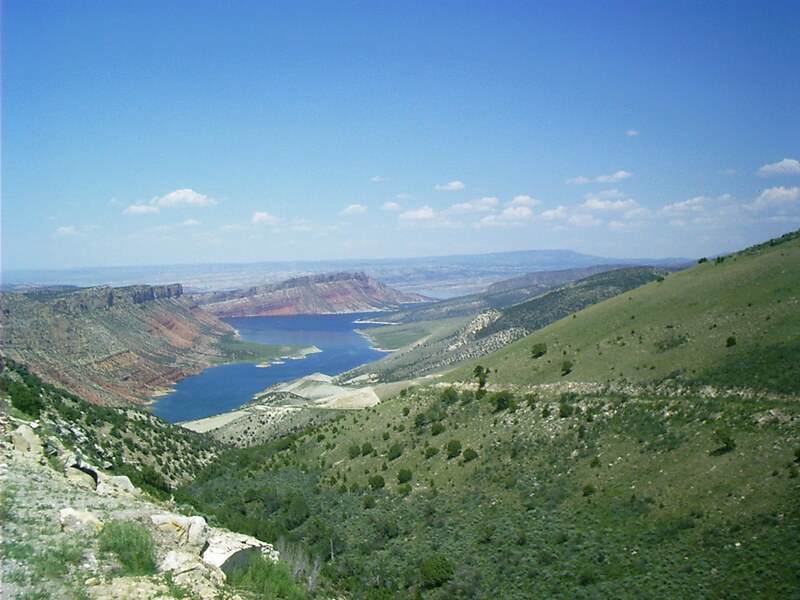 The Chorpenning/Hockaday Stage, operating over the central route from Missouri to California via Salt Lake City, received a subsidy of $320 thousand but generated receipts of only $5.4 thousand. The central route was faster, but the southern route through El Paso was favored by the Democratic administration, which was responsible for the Utah War. Government cost-cutting bankrupted the operators of the central route but left the operators of the southern route unscathed up to the eve of the Civil War. In April 1860, a firm, operating a stage line to Denver in Kansas Territory and possessing government contracts to supply army bases in the West, began operation of the Pony Express from St. Joseph, MO, to Sacramento, CA, via Salt Lake City in Utah Territory. Although the parent company collapsed in scandal and insolvency, the Pony Express continued. After Texas seceded from the Union, the US Congress awarded the transcontinental mail contract to Ben Holladay to run over the central route. He had bought out the Butterfield Overland Despatch (not to be confused with the Butterfield Overland Mail, which was a different company with different ownership). When the Pony Express infrastructure was finally liquidated, he consolidated the assets with his stagecoach line. "The identity and location of Machette's Station remains controversial. 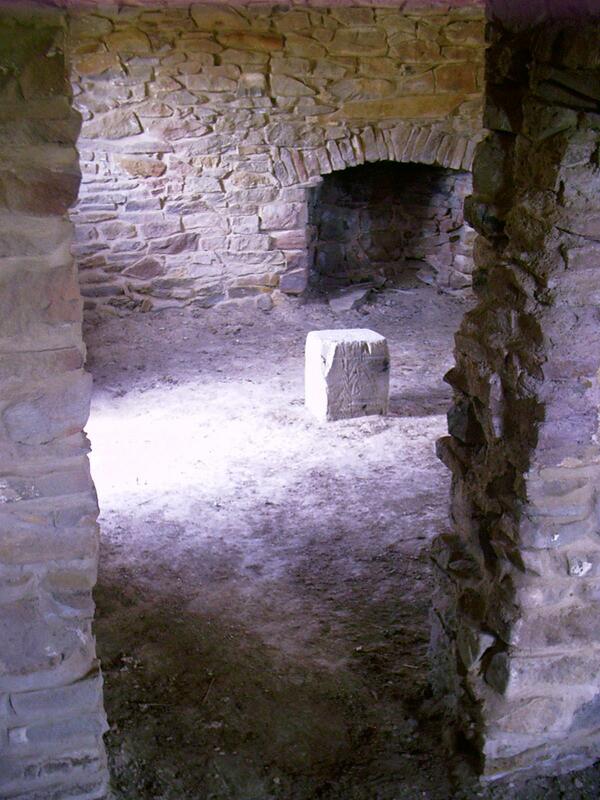 Local tradition places the site on the Williams' Upper 96 Ranch, four miles east of Fort McPherson in Lincoln County, Nebraska. Up until 1931, there was a two-story log cabin and a blacksmith shop linked to this site. However, in 1931 the American Legion Post No. 64 dismantled the main two-story log structure from the original site and moved the log building to Gothenburg City Park, where it was reassembled into a one-story building. Tourism signs along the highway advertise the building as an original Pony Express station. A marker attached to the building tells visitors that 'Machette' built the cabin in 1854 as a trading post and ranch house, that the Pony Express used it from 1860-1861, and that it served as an overland station, dwelling, bunk house and storage house on Upper 96 Ranch afterwards." • Godfrey, Anthony. 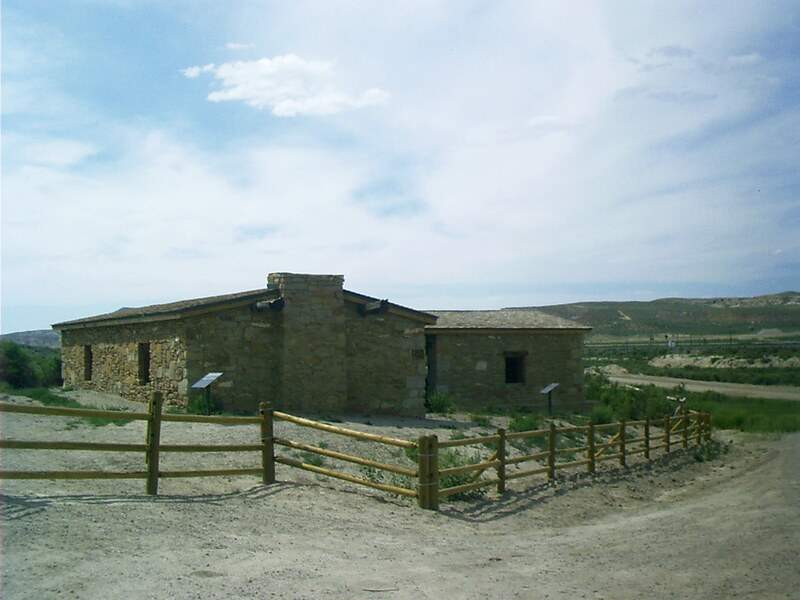 Pony Express National Historic Trail: Historic Resource Study. Aug. 1994. National Park Service. 25 Sept. 2007 <http://www.nps.gov/archive/poex/hrs/hrst.htm>. "On June 16, 1860, about ten weeks after the Pony Express began operations, Congress authorized a bill instructing the Secretary of the Treasury to subsidize the building of a transcontinental telegraph line to connect the Missouri River and the Pacific Coast. "The passage of the bill resulted in the incorporation of the Overland Telegraph Company of California and the Pacific Telegraph Company of Nebraska. On July 4, 1861, Edward Creighton began building the Nebraska company's line westward from Julesburg, Colorado, toward Salt Lake City. Twelve hundred miles to the west on the same day at Fort Churchill in Nevada, James Gamble set the first pole in the Overland Telegraph Company's line. "While the lines were under construction the Pony Express operated as usual. Letters and newspapers were carried the entire length of the line from St. Joseph to Sacramento, but telegrams were carried only between the rapidly advancing wire ends. "On October 20, 1861, Creighton won the race to Salt Lake City. Four days later Gamble's crew arrived. On October 26 the wires were joined, and San Francisco was in direct contact with New York City. On that day the Pony Express was officially terminated, but it was not until November that the last letters completed their journey over the route." • United States. Dept. of the Interior. National Park Service. 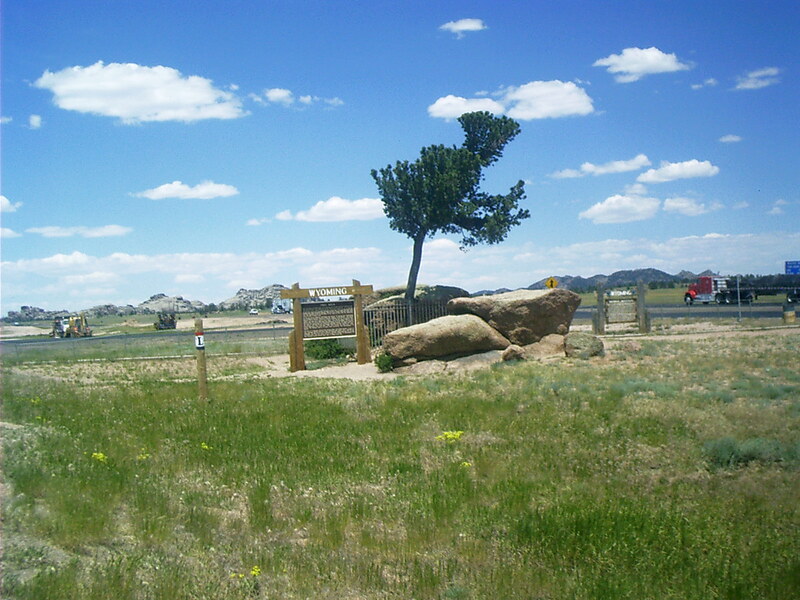 "Pony Express National Historic Trail: History & Culture." 27 Sept. 2006. 26 Sept. 2007 <http://www.nps.gov/poex/historyculture/index.htm>. "Early in 1862 the Central Overland California and Pikes Peak Express [the Pony Express] experienced a reorganization when Ben Holladay took over the stage business and the overland mail subsidy contract. 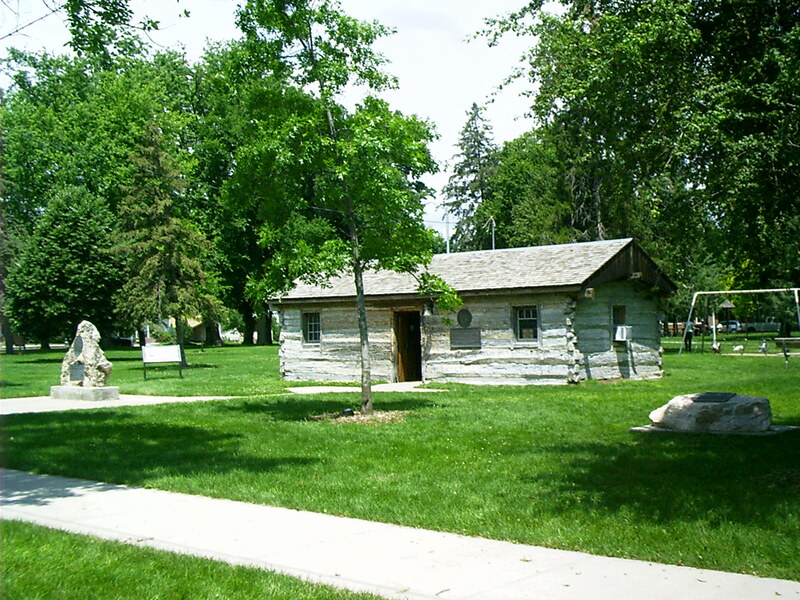 The earliest central stage route had followed the Oregon Trail through Wyoming but in July, 1862, Holladay abandoned it in favor of the Overland Trail farther south and renamed the C.O.C. and P.P.E., the Overland Stage Company. Withdrawal of troops from various western forts during the Civil War made the Oregon Trail vulnerable to attacks by Indians. Also, the 1859 gold rush spurred economic development in the Colorado Rockies, resulting in a demand for daily mail and stagecoach service to connect Denver with the main transcontinental line. Finally, the southern route was 100 miles shorter than the Oregon Trail." "This particular six-horse coach was first used on the stage line to the gold fields of Nevada, and was later brought to Wyoming when the Cheyenne-Deadwood line was established in 1876." • Pamphlet. Stagecoach Museum. 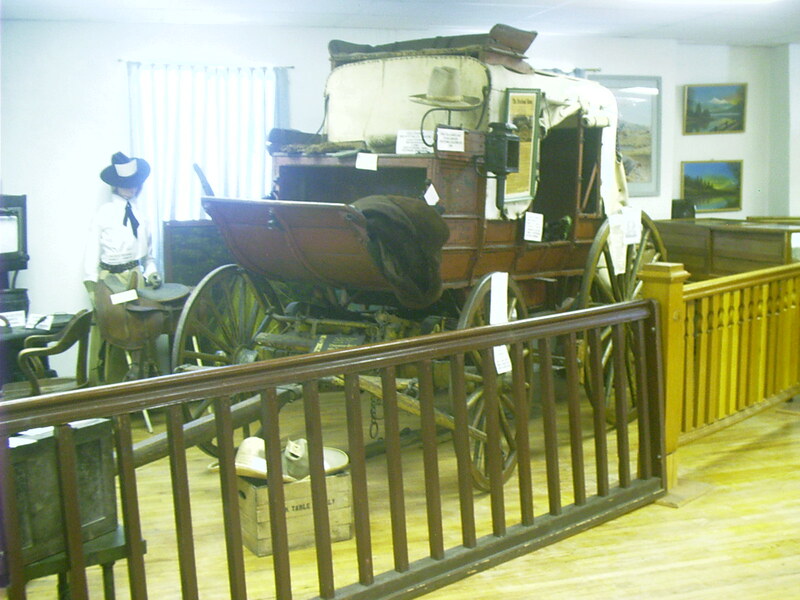 [Lusk, WY]: [Stagecoach Museum], [c. 2007]. • Twain, Mark [Samuel Clemens.] Roughing It. 1872. Prod. David Widger. 2006. Project Gutenberg. 5 Aug. 2007 <http://www.gutenberg.org/files/ 3177/3177-h/3177-h.htm>. "Our coach was a great swinging and swaying stage, of the most sumptuous description—an imposing cradle on wheels. It was drawn by six handsome horses, and by the side of the driver sat the 'conductor,' the legitimate captain of the craft; for it was his business to take charge and care of the mails, baggage, express matter, and passengers. We three were the only passengers, this trip. We sat on the back seat, inside. About all the rest of the coach was full of mail bags—for we had three days' delayed mails with us. Almost touching our knees, a perpendicular wall of mail matter rose up to the roof. There was a great pile of it strapped on top of the stage, and both the fore and hind boots were full. We had twenty-seven hundred pounds of it aboard, the driver said—'a little for Brigham, and Carson, and 'Frisco, but the heft of it for the Injuns, which is powerful troublesome 'thout they get plenty of truck to read.'" "The Stations were not all alike in number of buildings or in services offered to the traveler. Some had merely one room and a few pieces of furniture. Nearby, or attached to the simple structures, were corrals for livestock. Known as 'swing' stations these stops usually offered the traveler a poor bill of fare." "'Home' stations had several buildings offering larger and more commodious quarters, overnight sleeping rooms, and served better food than could be found at swing stations. In 1860 the famous British explorer Sir Richard Burton (He was knighted in 1886.) visited Salt Lake City in Utah Territory. He joined the British Foreign Service in 1861. 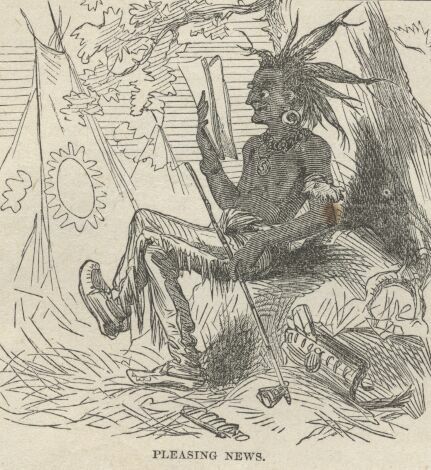 In 1862 he published the travelog of his American journey. The timing and sequence of events have raised speculation that he may have been operating covertly. Our breakfast was prepared in the usual prairie style. First the coffee—three parts burnt beans, which had been duly ground to a fine powder and exposed to the air, lest the aroma should prove too strong for us—was placed on the stove to simmer till every noxious principle was duly extracted from it. Then the rusty bacon, cut into thick slices, was thrown into the fry-pan: here the gridiron is unknown, and if known would be little appreciated, because it wastes the "drippings," which form with the staff of life a luxurious sop. Thirdly, antelope steak, cut off a corpse suspended for the benefit of flies outside, was placed to stew within influence of the bacon's aroma. Lastly came the bread, which of course should have been "cooked" first. The meal is kneaded with water and a pinch of salt; the raising is done by means of a little sour milk, or more generally by the deleterious yeast-powders of the trade. The carbonic acid gas evolved by the addition of water must be corrected, and the dough must be expanded by saleratus or prepared carbonate of soda or alkali, and other vile stuff, which communicates to the food the green-yellow tinge, and suggests many of the properties of poison. A hundred-fold better, the unpretending chapati, flapjack, scone, or, as the Mexicans prettily called it, "tortilla!" The dough, after being sufficiently manipulated upon a long, narrow, smooth board, is divided into "biscuits" and "dough-nuts," and finally it is placed to be half cooked under the immediate influence of the rusty bacon and graveolent antelope. "Uncle Sam's stove," be it said with every reverence for the honored name it bears, is a triumph of convenience, cheapness, unwholesomeness, and nastiness—excuse the word, nice reader. This travelers' bane has exterminated the spit and gridiron, and makes every thing taste like its neighbor: by virtue of it, mutton borrows the flavor of salmon trout, tomatoes resolve themselves into greens. I shall lose my temper if the subject is not dropped. • Burton, Richard F. The City of the Saints, and Across the Rocky Mountains to California. New York: Harper and Brothers, 1862. University of Michigan Library. 84. 28 Aug. 2007 <http://quod.lib.umich.edu/cgi/t/text/text-idx?c=moa;idno=AFK4700.0001.001>. The furniture of the hut was neither gorgeous nor much in the way. The rocking-chairs and sofas were not present, and never had been, but they were represented by two three-legged stools, a pine-board bench four feet long, and two empty candle-boxes. The table was a greasy board on stilts, and the table-cloth and napkins had not come—and they were not looking for them, either. A battered tin platter, a knife and fork, and a tin pint cup, were at each man's place, and the driver had a queens-ware saucer that had seen better days. Of course this duke sat at the head of the table. There was one isolated piece of table furniture that bore about it a touching air of grandeur in misfortune. This was the caster. It was German silver, and crippled and rusty, but it was so preposterously out of place there that it was suggestive of a tattered exiled king among barbarians, and the majesty of its native position compelled respect even in its degradation. He sliced off a piece of bacon for each man, but only the experienced old hands made out to eat it, for it was condemned army bacon which the United States would not feed to its soldiers in the forts, and the stage company had bought it cheap for the sustenance of their passengers and employees. We may have found this condemned army bacon further out on the plains than the section I am locating it in, but we found it—there is no gainsaying that. He had no sugar and no milk—not even a spoon to stir the ingredients with. "Oh—then help yourself to the mustard." "Coffee! Well, if that don't go clean ahead of me, I'm d-—d!" "Pass the bread, you son of a skunk!" No, I forget—skunk was not the word; it seems to me it was still stronger than that; I know it was, in fact, but it is gone from my memory, apparently. However, it is no matter—probably it was too strong for print, anyway. It is the landmark in my memory which tells me where I first encountered the vigorous new vernacular of the occidental plains and mountains. • Twain, Mark [Samuel Clemens.] Roughing It. 1872. Prod. David Widger. 2006. Project Gutenberg. 5 Aug. 2007 <http://www.gutenberg.org/files/3177/3177-h/3177-h.htm>. In 1862 Congress (less the Confederate States) commissioned the Union Pacific to build the eastern portion of the first Transcontinental Railroad across North America starting at Omaha in Nebraska Territory. 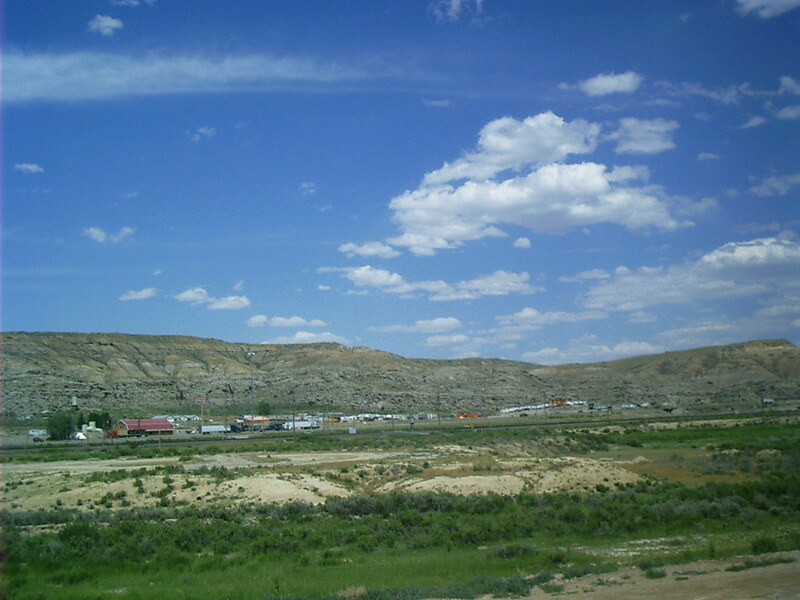 The UP reached Point of Rocks in Wyoming Territory in 1868, which then became the jumping-off point for access to the gold mines around South Pass City. In 1869, the UP joined the Central Pacific at Promontory Point in Utah Territory, and transcontinental rail service began, dominating other modes of long-distance overland travel until the advent of the automobile after the turn of the century. 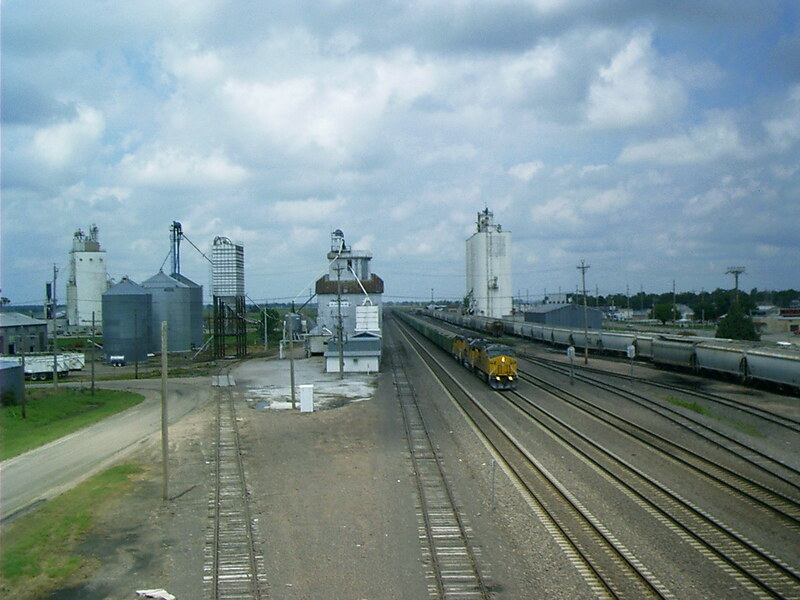 Standing on the SR 21 overpass at Cozad, NE, I was astonished that I was able to keep four or five freight trains in sight. The headlights of at least two were always visible in both directions. It seemed to me a train passed beneath the viaduct about every ten minutes. 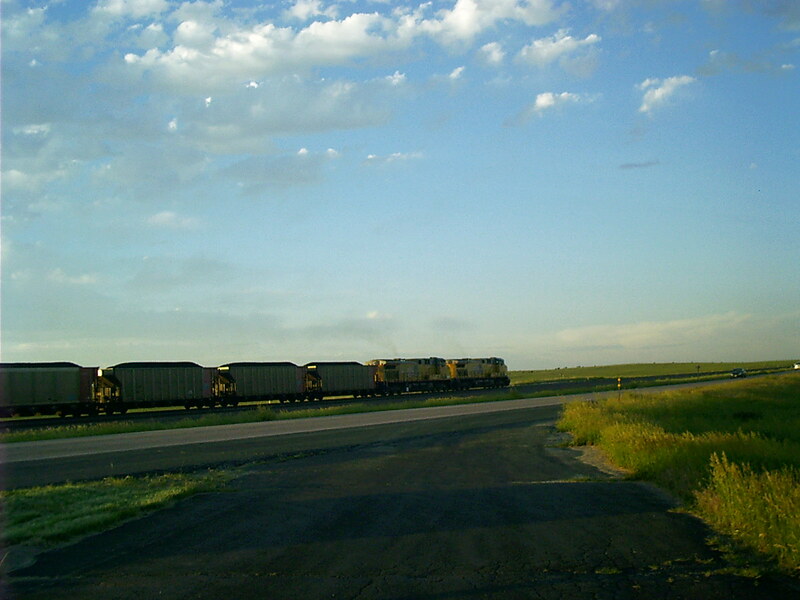 The Burlington Northern Santa Fe railroad hauls coal from the Powder River Basin of Wyoming through Grand Island, NE, to points east. It seems to run trains about every fifteen minutes. "In 1913 the Lincoln Highway Association was formed 'To procure the establishment of a continuous improved highway from the Atlantic to the Pacific.' The Lincoln Highway was an instant success in a nation enamored with the newfangled automobiles and eager for a place to drive them. The Lincoln passed right by Tree Rock as did U. S. 30 in the 1920s and Interstate 80 in the 1960s. At this place the road was approaching the 8,835-foot Sherman Summit, the highest point on the Lincoln. The view of the surrounding mountains was like nothing that west-bound easterners had ever seen. Still, they noticed the little tree, which became the favored subject of many early postcards and photographs. It still is. 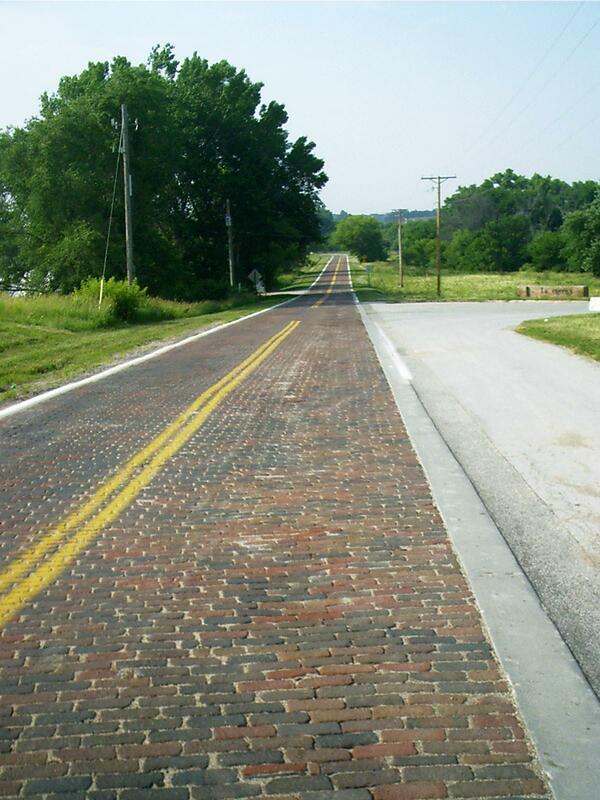 Today Douglas County Road 120 east of Elkhorn preserves a 2-1/2-mile length of the 1920 brick alignment of the Lincoln Highway. The pavement has held up reasonably well. Be aware though that, while it was never required to be as level as today's highways, it is not as level as it was when it was new, either. Also, the corners are not banked, so go easy when driving on this segment. 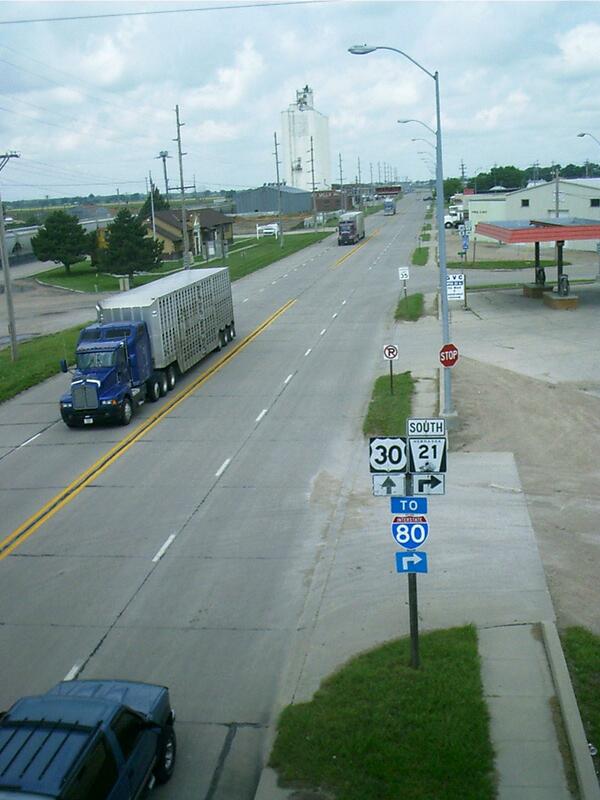 US 30 is the numerical successor to the Lincoln Highway in these parts. Like the UP and I-80, it carries its share of commerce yet. This is what Home Improvement would have looked like if, instead of Wilson, Tim Allen's neighbor had been Abraham Lincoln. 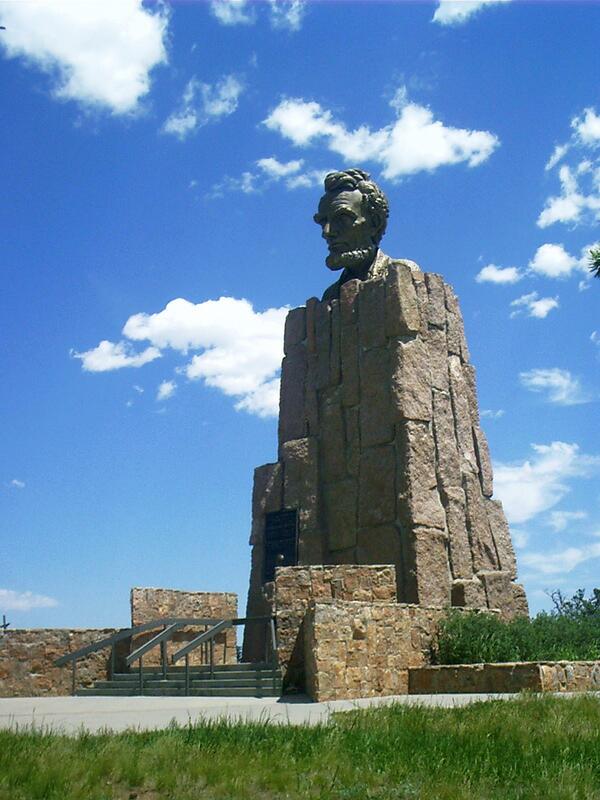 "In 1959, beside old Highway 30, a monument honoring Abraham Lincoln was unveiled here at Sherman Summit. 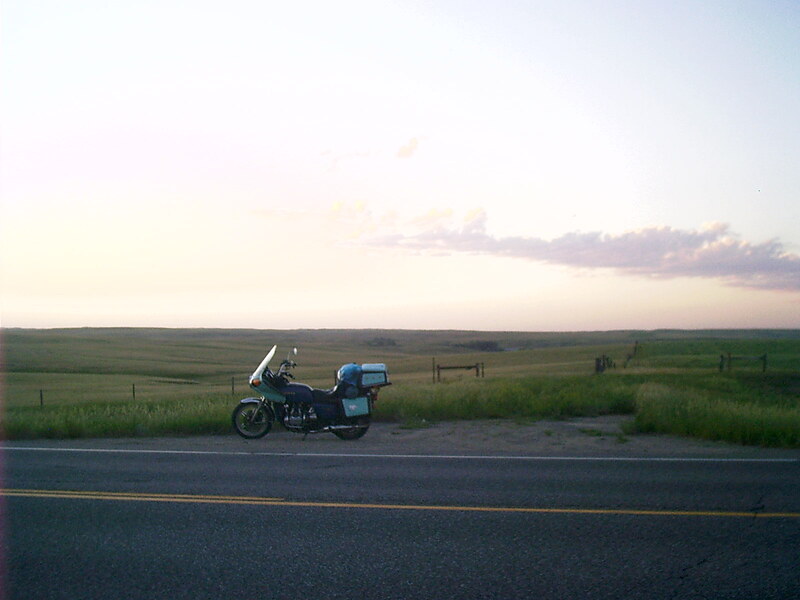 At 8,835 feet, the summit was the highest point on the transcontinental route known as the Lincoln Highway. 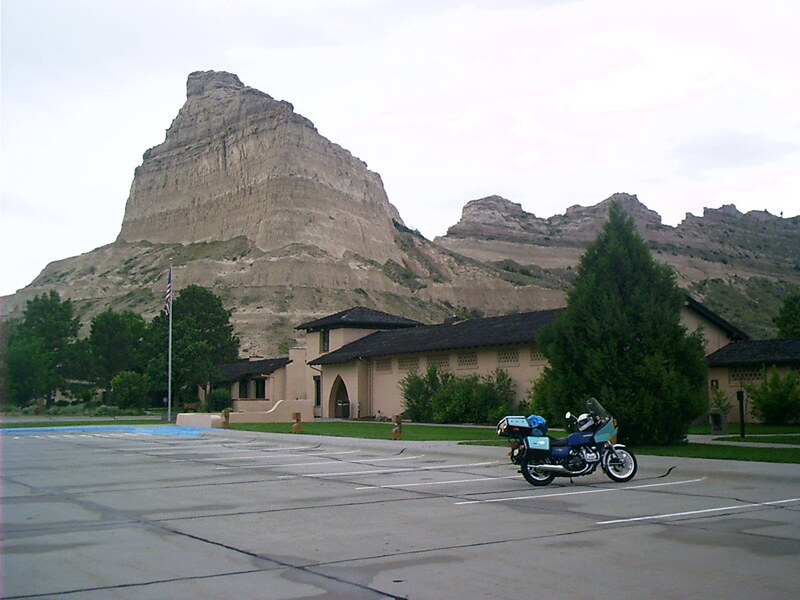 In 1968, following the completion of Interstate 80, workers moved the monument several hundred yards north to the Interstate rest area." "Little America -- well-known to I-80 travelers as The World's Largest Gas Station -- was named after Admiral Byrd's camp on the South Pole. Opened in 1932 by S.M. Covey, the refueling stop along the Lincoln Highway grew to include scores of gas pumps, a hotel, restaurants and a post office. 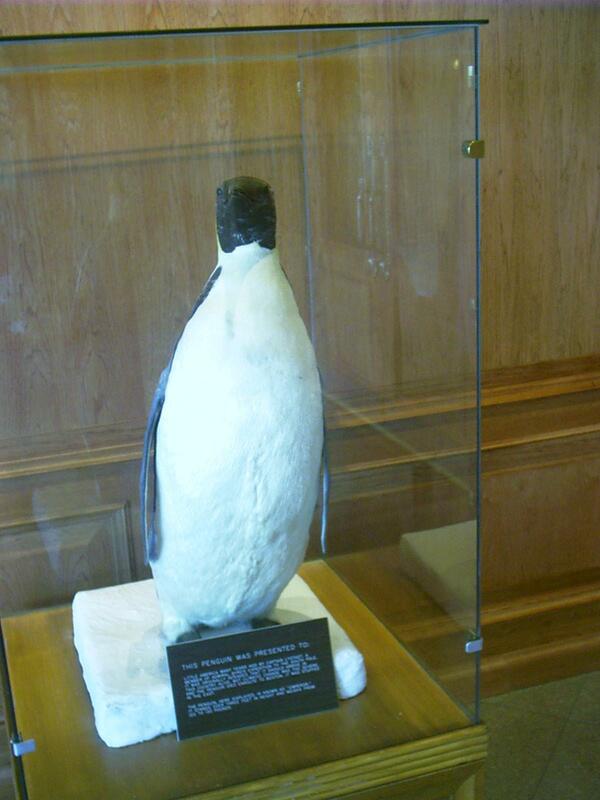 "The owners wanted Emperor the penguin to be its live mascot, but the penguin died on its way from Antarctica to Boston. Wanting to make the best of a bad deal, Little America had Emperor stuffed and shipped anyway. 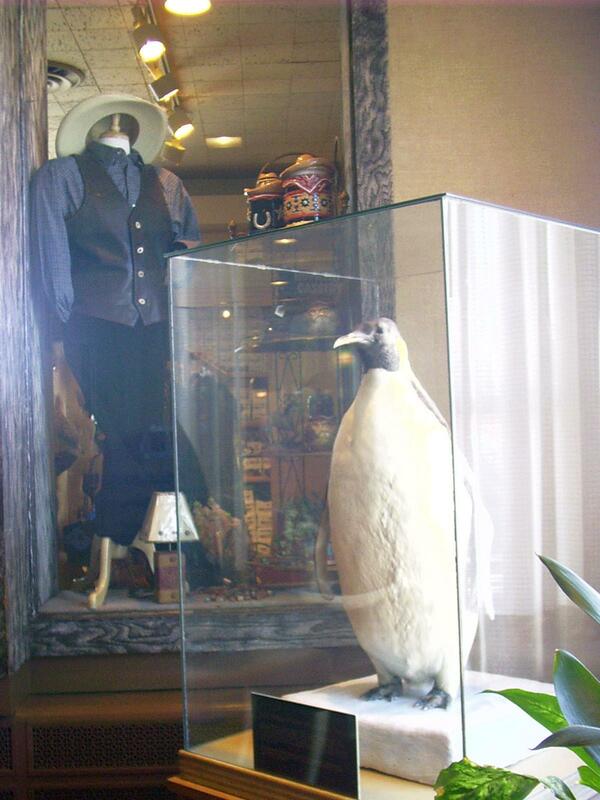 "You can visit the famous bird in a wide, wood-paneled hallway on the ground floor of the Little America hotel. He stands on a fake block of ice. "Emperor's glass case is inviolable; you'll never see this bird wearing a Santa's cap or a New Year's diaper. In the words of one Little America employee: 'The management doesn't allow joviality with the penguin.'" • Kirby, Doug, Ken Smith, and Mike Wilkins. "Emperor the Penguin." Roadside America. 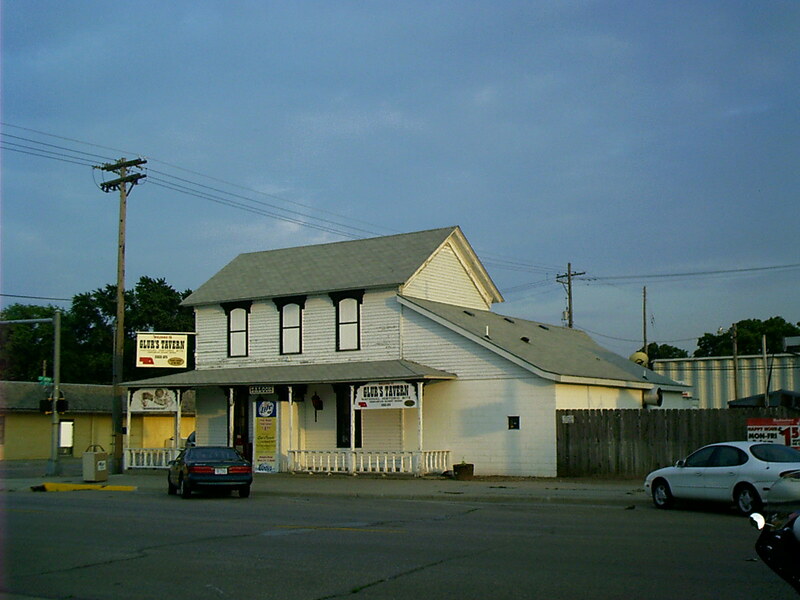 24 Sept. 2007 <http://roadsideamerica.com/pet/emperor.html>. ... but what's this? The Little America property in Cheyenne, WY, features a bird fetish of its own. Is the story of a single expired mascot apocryphal? You be the judge. • "The Death of Mary, Queen of Scots." Monty Python's Flying Circus. BBC. 24 Nov. 1970. 21 Sept. 2007 <http://www.youtube.com/watch?v=1k1ccguXiws&mode=related&search=>. By the way, I designed and edited my Website entirely in Linux. No actual penguins were harmed in making this Website. 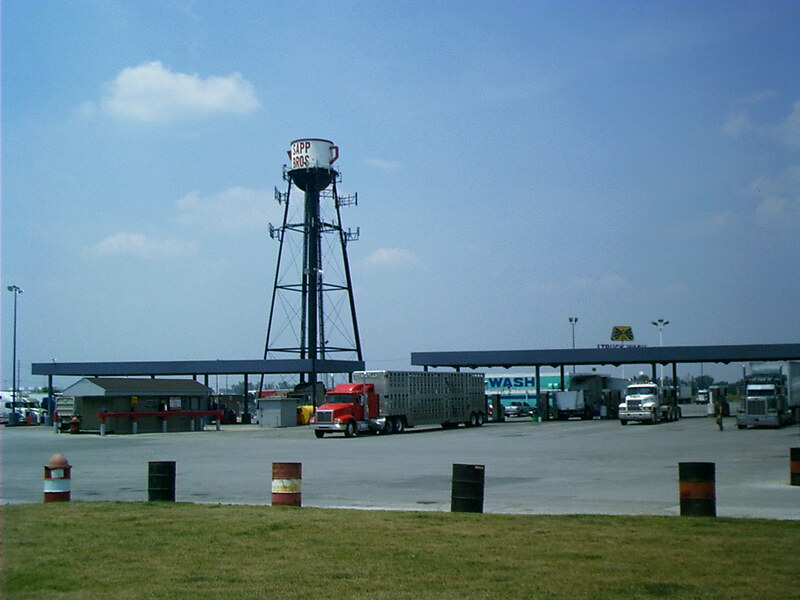 Truck stops are the modern analog to stage stations and taverns along the Lincoln Highway. See the water tower masquerading as the trademark coffee pot. A fellow was parking his car just as I was parking my motorcycle, and he made a point of asking me, "Does that bike get out of town?" I, of course, asked him to repeat himself and then told him I was from Sheboygan, WI. We were both somewhat amused. 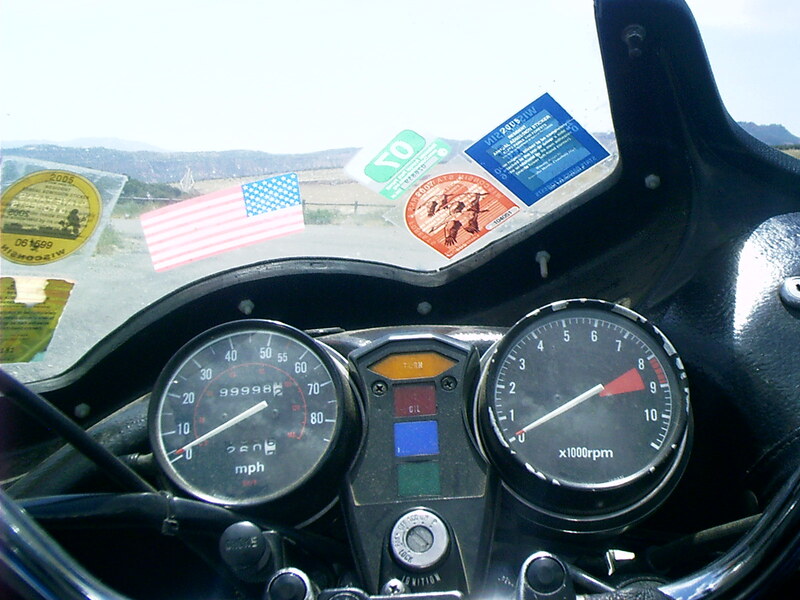 In case you've haven't twigged that I took this trip on a motorcycle, let me mention that I found it a practical and pleasant mode of travel. 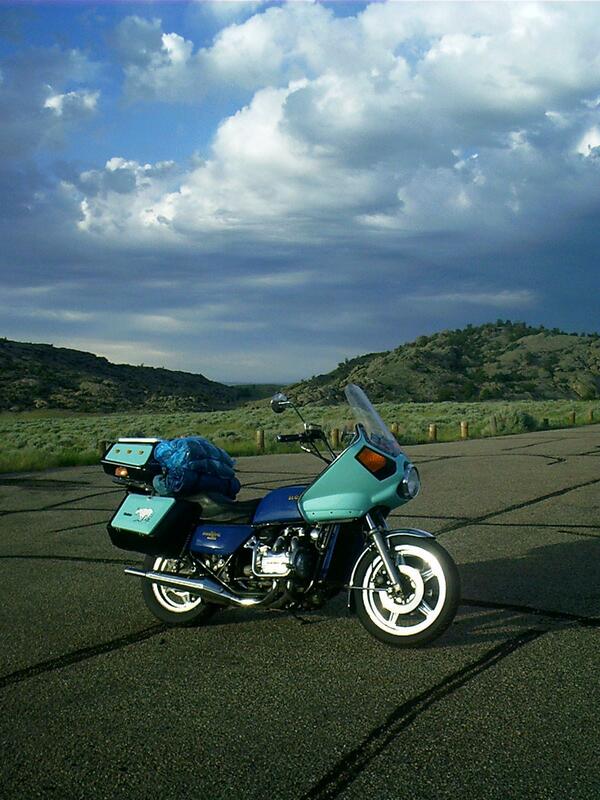 This is Geraldine, my 1979 GL1000 one liter Honda Goldwing touring bike. It is heavy enough to ride well on Interstates as well as secondary roads and has enough power to keep ahead of traffic. It has sufficient storage to stow camping gear for one person. This trip was 4400 miles long. Geraldine made 4200 miles of it under her own power, crossing the Mississippi River back into Wisconsin and conking out in Mineral Point. The engine started making a racket, and, while it would start and run, I dared not rely on it any further. I rented a U-Haul in Mineral Point and brought the bike home. I swapped engines with a low-mileage 1978 parts bike I had on hand. Subsequent exploratory surgery on the original motor revealed that a piece of the alternator rotor had come loose again and jammed up against the stator. 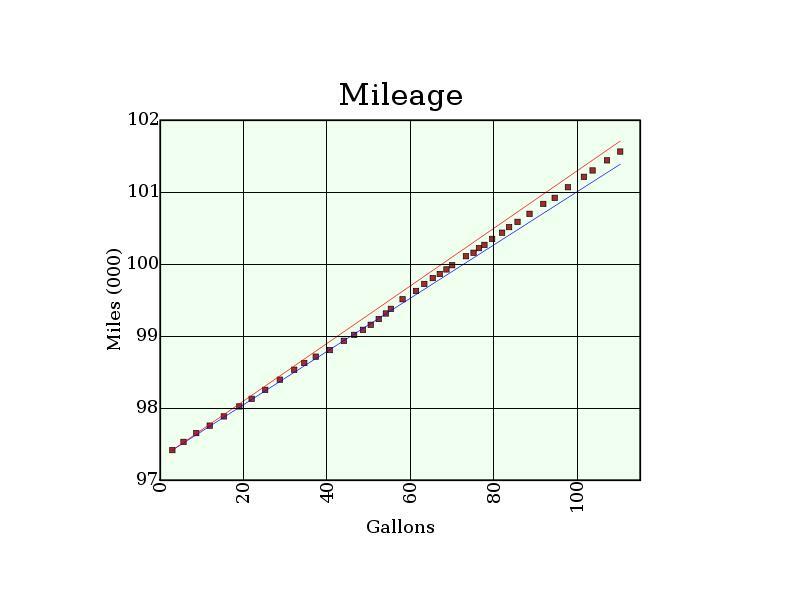 Geraldine used 110 gallons of gasoline, thus averaging between 37 miles per gallon (the blue line on the graph) and 40 miles per gallon (the red line on the graph). Fuel cost was $348 for an average price of $3.16 per gallon. The highest price was $3.499 just outside the entrance to Canyonlands National Park, except for the $3.99 I paid once at three minutes to quitting time in a marina near Alcova, WY. The lowest price was $2.859 at what must have been Chugwater, WY. Mileage overall would have been better but for one exceptionally hot, windy afternoon at about 98.8 thousand miles on the odometer. In the Far West I indulged in more frequent fill-ups because sources of fuel were more widely scattered and I felt I ought to buy it wherever it was available to avoid running out of it. That is why the data points are closer together in the middle of the graph. During the trip the fuel supply to the #2 cylinder was constricted. It was blocked by a plug of silicone sealant I had used to assemble the air plenum. Although I disassembled the #2 carburetor in camp at Moab and made some improvement, I didn't discover the plug until after I had returned home and swapped engines. It remains merely to say how our modern system of highways created a demand for edification and entertainment. Nowadays federal and state tax revenues support not only the means of travel but also the destinations. The places where history is preserved are never far off paved public rights of way, and monuments, historical sites and parks abound throughout the length and breadth of this great nation. Although many water projects have been built all over the West since the Great Depression, the main roads seem to avoid them. Probably this is because they are located in rough country. 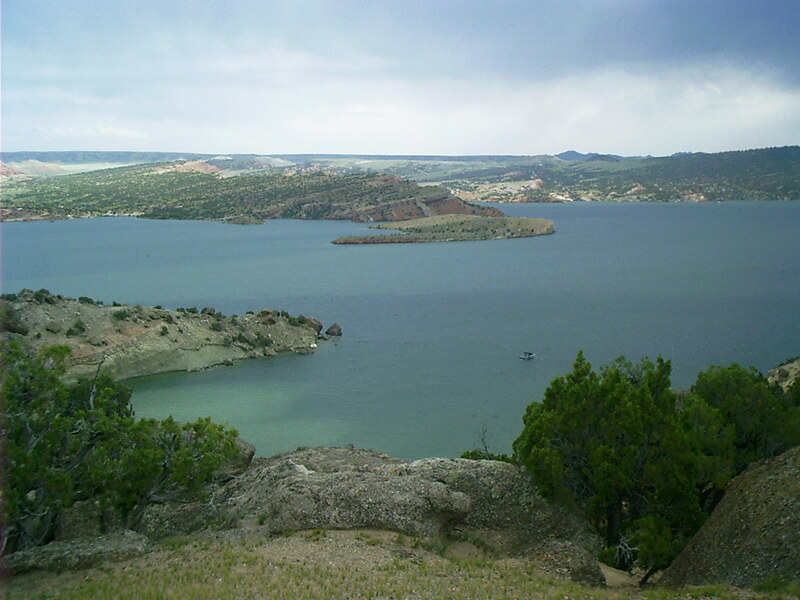 However, from time to time you catch a glimpse of a portion of a man-made lake while you're crossing a promontory from one gorge to another. This is not to say, though, that these features have no access roads. They surely do for the benefit of the power boaters that are so prevalent in the summer. Such roads are paved, traverse dramatic changes in altitude, and are crooked as a dog's hind leg — just the thing for exciting motorcycling except that they are occupied by wide, slow-moving traffic and, after all, they're all dead ends. And fondly their friendly, simple folk we bid adieu. To visitors who'll view them next and value them the more. We say goodbye, America, the Beautiful, the Blessed, to you. There's an old sea chanty remembered in over ten thousand variations whose tune and original rhythm are mostly only guessed at. Too slow and oddly syncopated for capstan use, it was taken up by keelboatmen as they poled up the Ohio River. It was known to the workingmen of St. Louis. No doubt the ferrymen regaled pioneer families with blue versions of the lyrics, transferring the pilgrims' wagons over the Platte at the various crossings. Oh, Shenandoah, I love your daughter. Weigh, hey, you rolling river! For her I've crossed the stormy water. For seven years I courted Nancy. No other girl would suit my fancy. For seven long years I courted Sally. I courted Sally down the valley. Oh, Shenandoah, I'll not deceive you. Look away, you rolling river! Oh, Shenandoah, I'll never grieve you. Oh, Shenandoah, I long to hear you. Far away, you rolling river! Rhode, Chuck. "Transportation." The Flat Route. 21 Jul. 2007. Lacus Veris. 24 Apr. 2019 <http://lacusveris.com/Moab/Snaps/Transportation.shtml>. Last modified 4 Oct. 2015. Served 14551 times between 16 May. 2010 and 24 Apr. 2019. Contact mailto:CRhode@LacusVeris.com?subject=The+Flat+Route.